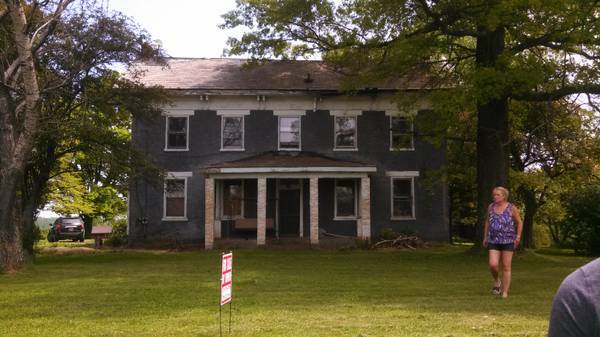 Megan sent me this Craigslist house that I wanted to share, in case anyone was interested. It sounds like this home is being torn down and that you have to tear out everything yourself, but the wording is strange so could be saying something else. Either way, here it is. Only contact if you are interested in the home, do not contact for any other reason. Craigslist link. Home built in 1819, materials are original to the home. Home is a 2 story brick, slate roof, barn wood, barn stone, full tree beams in roof of basements, mantles, door frames, arches and much more. Removal will be at owners expense. Home was beautiful in its times and has many materials to be salvaged. I wish they offered a peek inside. I’m heartbroken that it’s being sold as “building materials” but at least they’re not destroying everything. 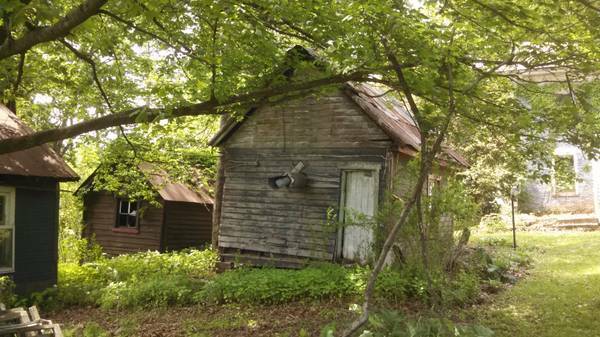 I hope a local finds that this is the “jackpot” he needs to restore his own home (or her own, of course). Can’t possibly be what they mean, but that makes it sound like the home’s owner will pay me to remove things from his house. That’d be a pretty sweet deal! I know, it’s not clearly written. I too wish I could see inside, I may look into it. 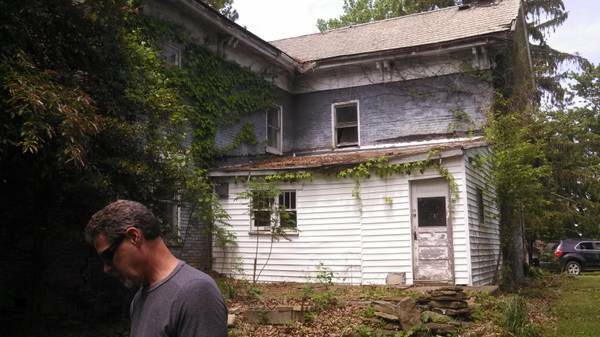 The saddest part of it is not only that the house looks exceedingly repairable, but that its cluster of outbuilding are still standing in relatively good, untouched condition. Hopefully the right person sees the ad and can work something out with the owner for the land AND materials . . . Reminds me of the ornate “mystery” Iowa Victorian house that the owner was insistent that it had to be dismantled despite ample evidence it was quite restorable. (interior photos were included) This house is a “for sale by owner” offering so its imperative anyone interested should get involved as quickly as possible. Brick houses can be moved (fairly expensive) but I suspect the owner has some purpose in mind for the site and his or her future plans do not include the house. Bricks from this period (usually hand made and fired on site) tended to be very soft and bonded with lime and sand mortar so moving the house might be impossible. In that case, the house elements could be numbered, palletized, and shipped on flatbed trucks. (museum restorers use a computer program to store information about where each numbered element goes and can print reconstruction plans from the program) One hauled to the new site, the house can be reconstructed essentially as it is now. Worth considering as not many houses from the Federal period survive. 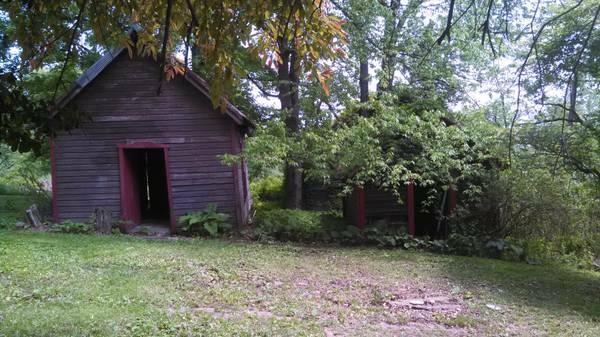 If it were my project, I’d want the outbuildings too. I’m guessing they mean it will be at the new owner’s expense to remove the house? Speaking of removal, how about removing all those people from the pictures before taking them? Anyway, looks like it was a great house. Would be nice to see someone restore vs. salvaging materials and tearing down. 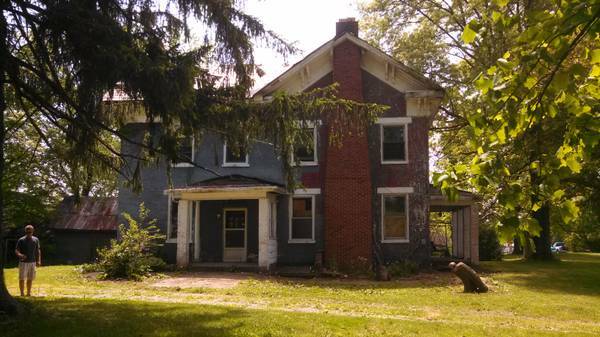 Two new posts on craigslist regarding this house, with some interior pictures, for those that are interested . . .
Wow, that really hurts to look at, knowing it’s all going to be pulled apart. I’m curious as to why they are tearing it down. A few more photos for those that were interested (I wish they’d stop posting them, breaks my heart every time) – it looks like demolition will take place sometime next year . . .
Wow, it is sad to see. 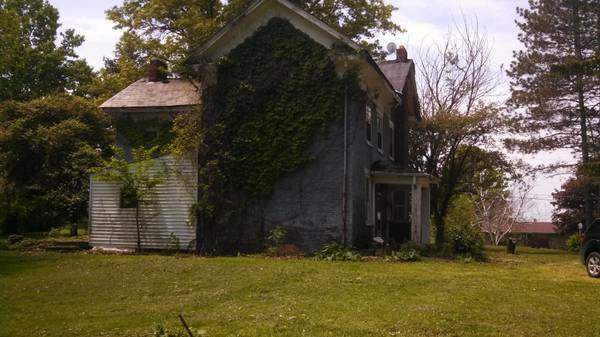 The more I see of the inside the more depressing it gets to know such a home could ever be torn down. 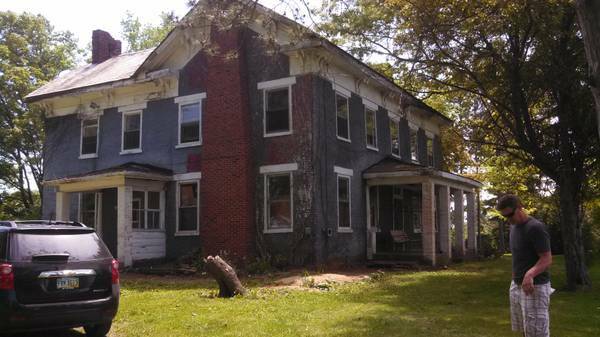 I really hope someone can salvage what they can before it gets demolished. There’s a small number (fortunately) of people who have zero appreciation for old structures or, their agenda-which includes the demolition of an old structure-is so personally important they wouldn’t change their minds even if Abraham Lincoln had given a speech there-to them, its an obstacle to progress. Interesting, at least they recognized the individual elements in the house had value if they did not for the house itself. Ohio in particular has had some sad losses along these lines. A multi-million dollar State funded program called Moving Ohio Forward (I couldn’t make up such a disingenuous name if I tried) set a “quota” of 100,000 structures for demolition state-wide to the end of this year. The program was so “successful” that additional funds have been found and diverted to continue the program into next year. An “environmental education” organization in Cincinnati a few months ago demolished the landmark 1870’s James Gamble house (he of Proctor & Gamble fame-the global company HQ is still in Cincinnati) after a multi-year fight in the courts with the City and local preservationists-ironically, the responsible organization was and still is funded by the generosity of Gamble Family descendants. I’ve frequently explained to those unfamiliar with Ohio’s historic architecture that the reason there’s so much there to see is because there was so much more to begin with. That rich architectural legacy is surely dwindling but still remains impressive. Until there is some monetary advantage to preserving old homes and buildings, these losses will continue until (like the American Bison which was thought to be limitless in numbers was decimated to the brink of extinction) there are few historic structures remaining. While the destruction of this early home seems to defy logic, I do appreciate that something is being saved even if the motive is strictly for the money. I hope some needy old home person salvaged some of the other stuff. I suppose these beams could be a score for someone.